Main components of fluidized bed CFRP recycling process. From . 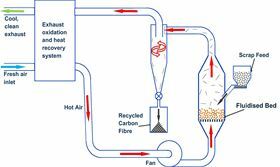 University of Nottingham/Boeing fluidized bed pilot plant for recycling CF. The demand for CFRPs is growing apace, with the automotive sector, for example, predicted to almost triple its usage from $ 2.4 billion in 2015 to $ 6.3 billion in 2021 . These needs are currently met by virgin CF (vCF), estimated to have grown from around 16 000 tonnes a year to 140 000 tonnes by 2020 . But the high financial and environmental cost of vCF is still limiting greater mass-market adoption. But the advantages of vCF currently come at a price. The manufacture of vCF has a large environmental impact; the process is wasteful, energy intensive, and mostly reliant on fossil-fuel-derived precursor materials. Moreover, as more CFRP products find a mass market, there will be a significantly growing need for an alternative to landfill or incineration as components reach the end of their useful life. In the UK, for example, these conventional disposal routes currently account for around 98% of composite waste. CFs can be manufactured in various ways, but the process is energy intensive, requiring very high temperatures, high cost, and usually calls for fossil-fuel-derived precursor material. Once CFs are utilized in RPs, the picture does not improve, with up to 40% of CFRP ending up as wasted during processing. There is also an emerging waste problem on the horizon. Some 6000-8000 aircraft are due to come to the end their lives by 2030, with manufacturers like Boeing aiming to recycle at least 90% of the constituent materials – including any CFRP. The automotive industry is also facing more stringent recycling targets. Since 2015, EU regulations have required recycling of at least 85% of end-of-life materials . With the relatively short service life (10-15 years) of cars, there will be increasing amounts of CFRP to recycle. The simplest means of recycling CFRPs is pyrolysis in which end-of-life composite material is shredded and then heated to high temperatures to burn off the polymer component. ELG Carbon Fibre has been operating the first and largest pyrolysis recycling plant in the West Midlands in the UK since 2009 [4,5]. The company is one of several around the world, in the US, Germany, Italy, and Japan, exploring the recovery of CF from manufacturing waste and end-of-life components . 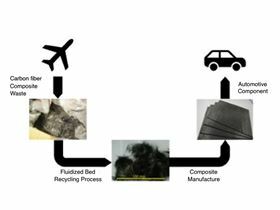 The limitation of such recycling approaches is that the resulting fibers are short and form a jumbled mass, very different from the long aligned fibers required for high-performance composites. While short, jumbled rCFRPs are unsuitable for high-performance components, there are less technical applications in consumer goods like bikes or tennis rackets available. Other recycling technologies in the pipeline, including chemical and fluidized bed processes, promise an attractive alternative producing higher-quality recycled fibers. Pioneered by Steve Pickering at the University of Nottingham, fluidized bed process is at the stage of transitioning from the lab to pilot-plant scale. Originally devised for recycling glass fiber, Pickering and his team have adapted the process over the last 5 years to recycle CF, with the support of Boeing. Waste material is first shredded (to 6-22 mm) before being fed into the fluidized bed reactor. A silica sand bed is used to volatize the material, decomposing the polymer matrix and releasing the fibers. Thanks to the fact that the silica bed retains all the contaminants, while the temperatures used in the reactor are not sufficient to damage the fibers, the process is particularly well suited to dealing with mixed waste or contaminated material. Fluidized bed process has, its proponents believe, the ability to recover good quality fibers. Moreover, according to Meng, the team at Nottingham is working on incorporating alignment technologies into the reuse process so that higher quality composites can be produced from recycled fibers. Preserving the length of fibers during recycling, using wet papermaking techniques to create nonwoven mats of shorter fibers or fiber alignment processes to produce aligned mats of short fibers can yield rCFRPs that are almost as good as vCFPRs, and certainly good enough for some applications. The technology to recycle CFRPs is starting to fall into place and the figures on the energy benefits of recycling CF seem to add up, according to the team at Nottingham, who has also been analyzing the economics of the process. “Industry reports claim that the manufacture of rCF achieves about 95% energy reduction compared with vCF, for comparable mechanical performance,” points out Meng. Overall, the researchers’ figures indicate that rCFRPs can reduce inherent greenhouse gas (GHG) emissions by around 45% compared with vCFRPs, a substantial improvement on conventional waste treatment or mechanical recycling. But no matter how compelling the energy and environmental benefits, the price has to be right – especially if rCFRPs are going to compete with conventional composites and lightweight materials – for large-scale adoption across the automotive and other mass-market sectors. The cost of vCF varies depending on the properties, from around $55/kg for standard civil engineering material to $1980/kg for high-end, high-spec fibers for more exacting aerospace applications [1,7]. Despite the challenges – in both technological and economic terms – the prospects for recycled CFRPs are starting to look attractive. As the first generation of CFRPs come to the end of their useful lives in larger volumes over coming decades, recycling could offer the attractive possibility of an almost closed cycle, whereby recovering CF from high-performance aerospace composites could drive the adoption of cheap rCFRPs in the automotive sector.